What differs in 2010, compared to previous EEA European environment — State and outlook reports, is an enhanced understanding of the links between environmental challenges combined with unprecedented global megatrends. This has allowed a deeper appreciation of the human-made systemic risks and vulnerabilities which threaten ecosystem security, and insight into the shortcomings of governance. • Continuing depletion of Europe's stocks of natural capital and flows of ecosystem services will ultimately undermine Europe's economy and erode social cohesion. Most of the negative changes are driven by growing use of natural resources to satisfy production and consumption patterns. The result is a significant environmental footprint in Europe and elsewhere. • Climate change — The EU has reduced its greenhouse gas emission and is on track to meet its Kyoto Protocol commitments. However, global and European cuts in greenhouse gas emissions are far from sufficient to keep average world temperature increases below 2°C. Greater efforts are needed to mitigate the effects of climate change and put in place adaptation measures to increase Europe's resilience. • Nature and biodiversity — Europe has established an extensive network of protected areas and programmes to reverse the loss of endangered species. However, widespread alteration of landscapes, degradation of ecosystems and loss of natural capital mean that the EU will not meet its target of halting biodiversity loss by 2010. To improve the situation we must prioritise biodiversity and ecosystems in policymaking at all scales, particularly addressing agriculture, fisheries, regional development, cohesion and spatial planning. • Natural resources and waste — Environmental regulation and eco-innovation have increased resource efficiency through a relative decoupling of resource use, emissions and waste generation from economic growth in some areas. However, absolute decoupling remains a challenge, especially for households. This indicates scope not only to improve production processes further, but also to alter consumption patterns to reduce environmental pressures. • Environment, health and quality of life — Water and air pollution have declined but not enough to achieve good ecological quality in all water bodies or to ensure good air quality in all urban areas. Widespread exposure to multiple pollutants and chemicals and concerns about long-term damage to human health together imply the need for more large-scale pollution prevention programmes and the use of precautionary approaches. • Links between the state of Europe's environment and various global megatrends imply increasing systemic risks. Many key drivers of change are highly interdependent and likely to unfold over decades rather than years. These interdependencies and trends, many of them outside Europe's direct influence, will have significant consequences and potential risks for the resilience and sustainable development of Europe's economy and society. Better knowledge of the linkages and associated uncertainties will be essential. 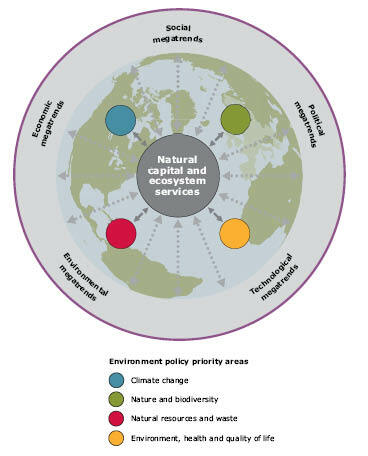 • The notion of dedicated management of natural capital and ecosystem services is a compelling integrating concept for dealing with environmental pressures from multiple sectors. Spatial planning, resource accounting and coherence among sectoral policies implemented at all scales can help balance the need to preserve natural capital and use it to fuel the economy. A more integrated approach of this sort would also provide a framework for measuring progress more broadly and underpin coherent analyses across multiple policy targets. • Increased resource efficiency and security can be achieved, for example, using extended life cycle approaches to reflect the full environmental impacts of products and activities. This can reduce Europe's dependence on resources globally and promote innovation. Pricing that takes full account of resource use impacts will be important for steering business and consumer behaviour towards enhanced resource efficiency. Clustering sectoral policies according to their resource needs and environmental pressures would improve coherence, address shared challenges efficiently, maximise economic and social benefits and help avoid unintended consequences. • Implementing environmental policies and strengthening environmental governance will continue to provide benefits. Better implementation of sectoral and environmental policies will help ensure that goals are achieved and provide regulatory stability for businesses. A broader commitment to environmental monitoring and up-to-date reporting of environmental pollutants and wastes, using the best available information and technologies, will make environmental governance more effective. This includes reducing long-term remediation costs through early action. • Transformation towards a greener European economy will ensure the long-term environmental sustainability of Europe and its neighbourhood. In this context, shifts in attitudes will be important. Together, regulators, businesses and citizens could participate more widely in managing natural capital and ecosystem services, creating new and innovative ways to use resources efficiently and designing equitable fiscal reforms. Using education and various social media, citizens can be engaged in tackling global issues such as meeting the 2°C climate target. The seeds for future actions exist: the task ahead is to help them take root and flourish. For references, please go to https://www.eea.europa.eu/soer/synthesis/synthesis/key-messages-1 or scan the QR code.